Definitely a guilt free banana bread, feel like having some slices rite now with a cup of tea..
Yumm and spongy Bread Dear.Luv it. Hi Julie,there's an award waiting for U at my space.Feel really honoured if U visit n collect it. wow..bread looks so so yummy.......i too feel like preparing....but can we prepare with out eggs?? Thank u pals for your quick responses..
@Chitra : yes, you can prepare the eggless version too, just increase the baking soda that is make it as 3/4 tsp -1tsp..this will surely work out. Bread looks so yummy and perfect..Love to have with a cup of Tea. Bread looks soft n delicious. Sent you my entry for the event. Pls check dear. Love this banana bread, so healthy! i like bananas, they are so flavorful, as such it is easy to like foodies with bananas added. The texture is amazing and particularly, the array of slices. Yummm. Yummy one Julie and done perfectly. Healthy and yummy breakfast recipe,perfectly done and got a nice texture. looks real yum. love banana in cakes and breads. Softy, healthy and yummy bread.. Very healthy, yummy and low fat too. So can make this often. Loved the snaps. Beautifully made and looks fabulous! It looks perfect; if it's low fat I always check it out;wow! 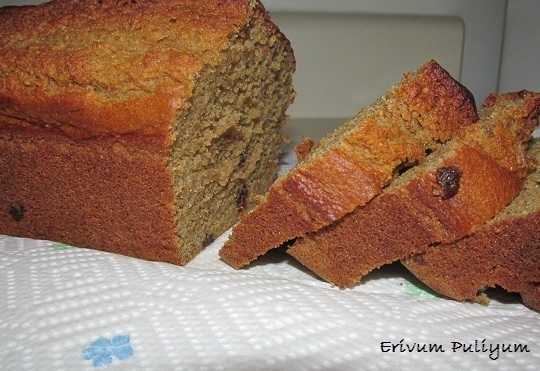 Banana bread esp low fat is an awesome recipe julie. Whenever i bake banana bread i love the aroma being filled in the entire house. A totally healthy and adorable version of banana bread! healthy and delicious banana bread..looks yum.. Perfect loaf of banana bread.